Specially written by an experienced teacher, Colloquial Yiddish offers a step-by-step approach to Yiddish as it is spoken and written today. 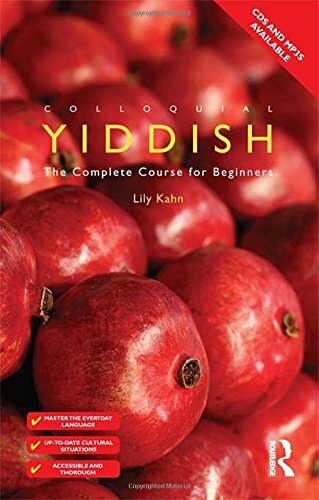 Colloquial Yiddish provides the first widely available, easily accessible, comprehensive Yiddish course designed primarily for the twenty-first-century international English-speaking independent learner and suitable for use in Yiddish classes worldwide. Each unit presents numerous grammatical points that are reinforced with a wide range of exercises for regular practice. A full answer key can be found at the back as well as useful vocabulary summaries throughout. supplementary texts presenting many of the most significant and relevant aspects of Yiddish culture. By the end of this rewarding course you will be able to communicate confidently and effectively in Yiddish in a broad range of situations. The complete course comprises the book and audio materials. These are available to purchase separately in paperback, ebook, CD and MP3 format. The paperback and CDs can also be purchased together in the great-value Colloquials pack. Lily Kahn is a postdoctoral researcher in the Department of Hebrew and Jewish Studies, University Colledge London.